Today was Day #5 of Chocolate and The Great Outdoors Theme Week. 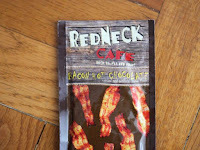 I like chocolate; and I like bacon. Both were part of my favorite outdoor camp breakfasts. 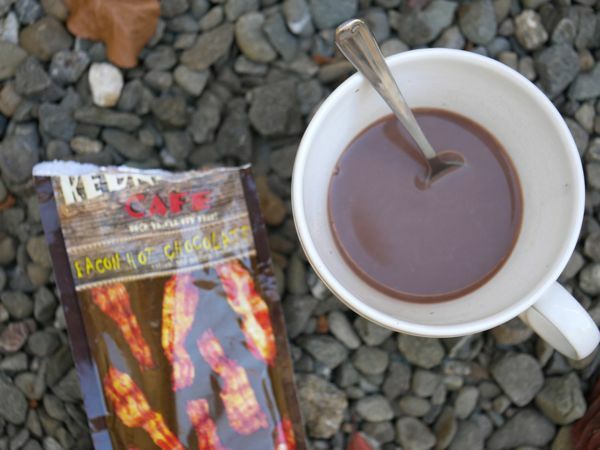 So heck yeah, I'll try this Bacon-flavored Hot Chocolate. As it turns out, that sentiment was nearly identical to the tagline printed on the package of today's hot chocolate, which read: "Heck Ya...I'll Try That." I do like to try new things. Created and distributed by McSteven's Inc. (Vancouver, WA), this single-serving packet of hot chocolate mix was convenient to "heat and eat" outdoors. Just add hot water, and stir. McSteven's sells a variety of hot chocolate and beverage mixes (some creatively packaged for Halloween this week). And scenes of people fishing in beautiful outdoor places adorn some of their coffee packaging. How did this "redneck" hot chocolate taste? Better than I thought it would. The bacon flavor was subtle, and a bit like the soy bacon bits I remember eating on buttered sourdough toast as a child that had a slight smokey and salty flavor. And the texture was smooth. When you're out in the great outdoors, in the cool, clean, crisp autumn air, everything seems to taste a little better.